What can cause a malocclusion? A malocclusion is a misalignment of teeth (mal = bad, occlusion = alignment of teeth). Malocclusions can also be due to misalignment of the jaw. What causes these situations? The horse of today has an upper and lower jaw that are of unequal size and even different shapes. This can cause no opposing surface for a tooth to wear. This is the reason for enamel points that need to be removed. Some of the other malocclusions seen are hooks, ramps, step mouth, wave mouth, shear mouth, missing and overpowering teeth (taller than its neighbors). What things can these issues cause? Some examples are problems with biting, lesions in the gums, cheek injury, jaw restriction, loss of feed when eating (as the horse has to open wider to chew to get past the restriction) and quidding (the wading or balling of food) is also very common and a constant with certain malocclusions. Hooks – The molar arcades lie slightly different from each other letting part of the front molar or the rear molars to not wear evenly. This is because it is unopposed and has nothing to wear against. This creates a pointed section of tooth that will overlap the opposite tooth. Ramps – The ramp is different from a hook as it is a more gradual rising of the molar and the whole tooth is involved vs. just part of the tooth. They are similar in the fact that they usually involve the first and last molars. Ramps can also cause the opposing tooth to be more worn down and it remains short as it can’t erupt any further than the opposing tooth will allow. Step Mouth – Step mouth is usually the result of the loss of an opposing tooth/teeth, or slow eruption of the tooth/teeth. The unopposed tooth than erupts faster than usual and becomes overpowering. Less severe cases can lead to or go hand in hand with wave mouth. Wave Mouth – Wave mouth usually involves more than one tooth and is an up and down curve of the molars. Wave mouth is not always the base problem in the mouth, but the result of other issues. This malocclusion can be improved, but usually takes more than one session depending on the height and number of teeth involved. Shear Mouth – In shear mouth the natural angle of the molars are steeper than what is considered average. This can create sharper enamel points than a horse with normal angles. This is due to the lack of opposing pressure that would normally wear down those points. Horses with condition tend to chew more up and down vs. in the normal orbital fashion. Excessive Transverse Ridges – The natural design of the chewing surface includes ridges that help to grind and break down food. These ridges sound relatively unimportant to movement, but this is not the case. If the ridges are excessively high, it can restrict front to back movement of the jaw. This also restricts and adds pressure to the TMJ joint. These ridges can be reduced to a more natural height with floats easily. Overpowering & Missing Teeth - Missing and overpowering teeth go hand in hand. If there is a missing tooth, the opposing tooth can then become overpowering since it does not have any pressure to wear it down. This means it becomes taller than its neighbors and will cause a lot of restricted or locking of the jaw movement. What things can these types of malocclusions cause? Incisors are very important to the comfort and function of the TMJ. When the incisors are unevenly worn or are overly long, they can cause uneven pressure and wear on the joint. This then causes soreness and headaches for the horse. It can also contribute to imbalances throughout the body as the TMJ is a huge information center. Incisor malocclusions should always be addressed and the incisors balanced along with the molars to insure the mouth is working as a whole unit. Slant – This is when the incisors are worn in a diagonal pattern vs. being in a horizontal line. Long incisors meet up with short ones and reverses on the other side. This can cause the molars to separate too early as the horse has to open wider sooner to accommodate the difference in lengths. The TMJ joint movement is also changed as they open wider and can cause soreness in the joint. Ventral Curve or “Smile” – Incisors curve upward at both sides creating a smile appearance. The lower corner incisors and the upper central incisors are too long. This can cause the molars to separate too early as the horse has to open wider to accommodate the difference in lengths. It can also result in the molar tables having steeper angles as there isn’t proper opposing pressure to wear them normally. The TMJ movement is also changed as they open wider to chew. Dorsal Curve or “Frown” – Incisors curve downward at both sides creating a frown type appearance. The upper corner incisors and the lower central incisors are too long. This can cause the molars to separate too early as the horse has to open wider to accommodate the difference in lengths. It can also result in the molar tables having steeper angles as there isn’t proper opposing pressure to wear them normally. The TMJ movement is also changed as they open wider to chew. Overly Long Incisors – Incisors are longer than average due to reduced grazing time, improper wear and no change to eruption rate. This creates incorrect pressure on the angle of the TMJ and will cause soreness in the joint. Incisors must be reduced to a more proper length and should be done in multiple visits depending on how long they are. Overbite or “Parrot Mouth” – This is where the upper incisors protrude over the lower incisors. Along with this incisor malocclusion there will also be hooks present on the upper first molars and lower rear molars. This is due to how the jaw lines up and that there are no opposing teeth to wear against in these places. If the lower incisors are too long this may cause irritation or lesions on the soft palette as the horse chews. Under bite or “Sow Mouth” – This is where the lower incisors protrude from under the upper incisors. Along with this incisor malocclusion there will also be hooks present on the lower first molars and upper rear molars. This is due to how the jaw lines up and that there are no opposing teeth to wear against in these places. If the upper incisors are too long this may cause irritation or lesions on the soft gums as the horse chews. Missing or Overpowering Incisors – Missing and overpowering teeth go hand in hand. If there is a missing tooth, the opposing tooth can then become overpowering since it does not have any pressure to wear it down. This means it becomes taller than its neighbors and will cause a lot of restricted or locking of the jaw movement. Periodontal disease shows up as small to large “pockets” in the gums and maybe located around and in between the teeth. These pockets can promote decay of the tooth as the feed or debris breaks down around the tooth. This is called bacterial fermentation and it gradually causes further destruction of the tooth. Periodontal disease can and will cause damage to the periodontal ligaments that surround and keep each tooth firmly in place if left un-treated. The worse the disease - the more likely it will get all the way down to the root. Periodontal disease is the number one cause of premature tooth loss and it does not discriminate between the types of teeth, so molars, canines and incisors can all be affected equally. Further problems can arise if the periodontal disease causes apical abscesses (around the root). These abscesses, if found in the upper cheek teeth (molars) can lead to sinus infections and nasal discharge. Many horses do not show outward signs but you may notice foul breath, weight loss, depression and some performance problems. In severe cases radiographs would be needed to determine how far the disease has actually gone. These radiographs will show if it has progressed to the root and if extractions are the best option to correct the problem. Just like any other problem or disease early detection is best and creates the best chance of stopping the progression of the disease. Treatment options: Have any and all malocclusions corrected as they can cause feed build up especially when the teeth are crowded, rotated or there is a lot of space between teeth. Regular maintenance of the mouth and gums are also a good preventative measure. This will help catch the disease. Frequent follow ups may be needed as the areas heal during treatment for periodontal disease. For mild cases sometimes routine rinsing or flushing of the mouth with an antiseptic solutions; like Chlorahexidine or Betadine Mix can help heal and prevent further damage. It is still recommended that you check with your vet for any further treatment. EOTRH starts with resorption lesions on the incisors and canines. It usually originates from the canines and works its way forward as the condition progresses. The onset is gradual but the diagnosis always seems to come well after the lesions have become extensive. This condition has existed for many years, but only has been identified and named recently. No underlying cause has been identified as of yet, so as on yet no preventative options are available. It is most common in older horses, but has been seen in horses as young as 13 years old. The teeth that are most at risk are the top and bottom incisors as well as the canines. This can become painful as it can cause the incisors to change position, loosen and even fracture. This is because as it progresses it causes the roots to dissolve all together and leaves the tooth without an anchor. Infection is highly likely in advanced cases and you may see red dots above the gum line or small pimple like draining tracts. Some horses then develop hypercementosis; which is the excess buildup of cementum (a main ingredient in a tooth) as the body tries to stabilize the affected teeth and keep them from moving. The best diagnosis tool for this condition is radiographs. Radiographs will identify which teeth are affected and will help decide which teeth should be extracted based on the stages of the lesions. The roots of the teeth will have a bulb like swelling showing at the root. Unfortunately extraction is currently the best option for horses with this condition. As with most cases early diagnosis is key, but horses don’t always exhibit sighs of oral pain until it is quite progressed. As severe changes occur, their gums will recede, they will start to lose weight, go off their feed and can be very irritable when bridled or ridden. The good news is horses tend to bounce back quickly once the affected teeth are extracted as it can help quiet down the effect on the adjacent teeth. This can remove the worst of the inflammation and discomfort. 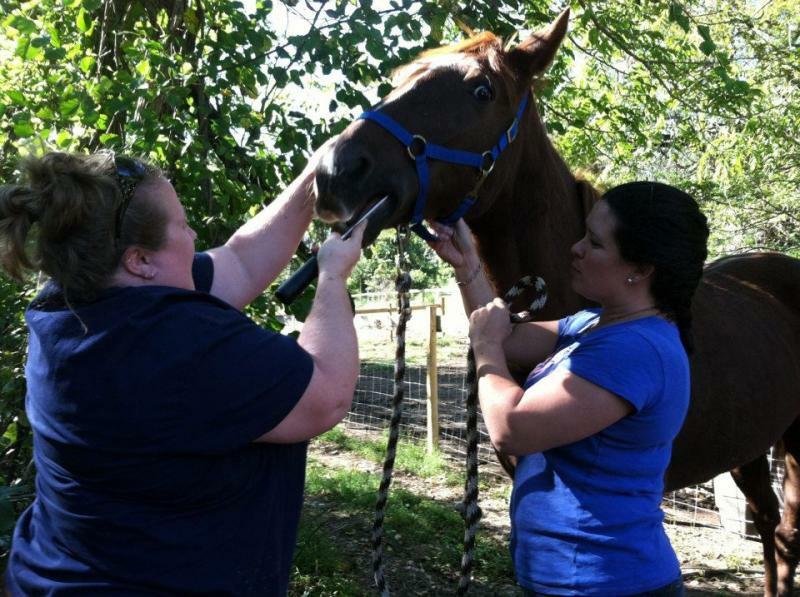 Fast healing even includes those horses that need all of the incisors removed all at once. Incisor-less horses do just fine and can easily learn to adapt to ripping grass and pulling hay with their lips. Most horses will need some level of antibiotics, a soft diet for a minimum of several weeks and no bitted riding for 2-4 weeks. Most are back to eating and grazing the following day. A couple extra facts found in a study of risk factors: Horses with EMS/PPID are 2 times more likely to develop EOTRH. This is due to the hormonal effects of cortisol on the periodontal ligaments. While high levels of glucose and insulin also increase risk due to their effect on essential components of cementum – laminitis alone is not a risk factor. Horses with previous periodontal disease are five times more likely to develop this condition. The following conditions don’t necessarily need to be diagnosed by a veterinarian, but if the cases are severe or are causing secondary conditions (infection, allergic reactions, etc) – please consult your veterinarian as medication might be required. Tarter can form on the canines, incisors and in abnormal spaces in the cheek teeth (molars). The horse will not have any clinical signs of illness, but left on the tooth or close to the gum, it can cause irritation and gingivitis. Tarter is simply the accumulation of calcified deposits around the tooth. Horses naturally produce bicarbonate in their saliva and this is a main ingredient in the tarter buildup. The lower canine is the most common place for tarter to build due to the location of the salivary gland. Tarter is easily removed by being scrapped, twisted or pulled off. There may be some irritation or slight bleeding around the base of the tooth after the tarter is removed; this should be temporary and heal quickly. Fox Tail Grass is an annual that is found throughout the US. The seed head resembles a bottle brush or fox’s tail (hence the name). This plant is very common in pastures and hay fields and is especially common after droughts and around recently disturbed soils. There are really no herbicides that can control it, so the best option is mowing to keep seed production down. Fox Tail doesn’t have any chemical toxin type effects on horses or other animals, but can cause some trauma to the mouth and gums. Signs of foxtail are plainly seen in your horse’s mouth and gums. The gums will be swollen or raised around the incisors and they can develop blisters or ulcers on the lips and in the mouth. Long time exposure may be the cause of some weight loss and digestive upset in some horses. The best form of treatment is to eliminate the contaminated hay or change hay suppliers, but since that can’t always been done or is not cost effective, other treatment is simple. For mild cases it might be as easy as weekly/bi-weekly rinses with antiseptic type washes like Chlorahexidine or Betadine and water mixes. For other cases – daily brushings can help by removing the spines that are the main source of the irritation in the plant. Brushing from the gum line down on to the tooth will help remove the spines from the gums (a small amount of bleeding is normal as the spines come out); then rinse to keep the area clean after brushing.